In 2002 the underground was introduced to a somewhat slept on album from Copywrite produced by RJD2 as they were fresh off the buzz of their super group MHz and RJ's signing to Def Jux. The album T.H.E. High Exhaulted was released on E.C. Records but was unfortunately poorly promoted and undershipped from the very beginning. The release of RJD2's Dead Ringers featured the track ''June'' with Copywrite and was a huge success and helped units of Copywrite's album move but it soon became out of print. 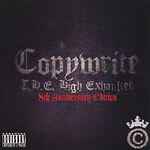 Copywrite and Man Bites Dog Records felt it necessary to update and re-release this early 2000's underground classic, so in addition to the 12 original tracks there are 8 new tracks including two very rare remixes (One by RJD2), with new artwork, new tracks and a remaster of the original album this record will surely earn its respect this time around. Produced by The Intalec (track 1); RJD2 (2, 6, 7, 10, 11, 12, 20); Camu Tao (3, 5, 8); Copywrite (4, 9); Mike Faceless (13); Rob Stern (14); Khrysis (15); Jay Notes (16); Joe Benny (17); Kount Fif (18 & 19).